A properly engineered rail system utilizes continuous lengths of bar across the entire length of the roof. 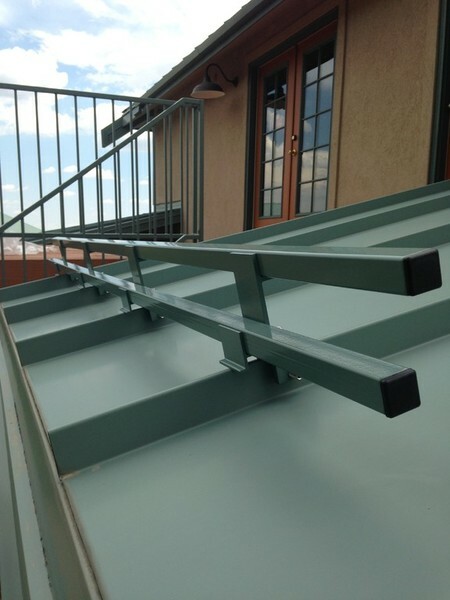 These bars are secured to the roof using non-penetrating, stainless steel seam clamps for standing seam roofs or mechanically fastened, aluminum brackets for exposed fastener roofs. We should know because we pioneered the use of seam mounted snow retention systems in the United States way back in 1992! The innovative SnoBar clamp remains the only patented, stainless steel clamp that allows for the bar to be top loaded. This allows for the fastest install times and fewer parts. SnoBar systems can be installed year round and typically require fewer rows than a traditional pad style snow guard system. SnoBar components are non-corrosive and have all been extensively lab and field tested. Our systems are backed by the industry's only Lifetime Warranty against failure, included at no additional cost on designed systems. Let us design a custom SnoBar or ColorBar system for you today! 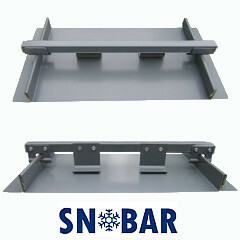 SnoBar is our standard duty bar and is typically specified for seams up to 16" wide. The bar is 1" square available in either 16 gauge clearcoated galvanized steel or custom ordered stainless steel. Both options offer superior corrosion resistance. SnoBar can be shipped in mill finish or can be custom powder coated for superior color matching to your panels! A SnoBar system can be designed for most roof panels and roof types, we have specialized mounts for membrane and shingle mounting too! Let us custom design a system for your project today! Our systems include all the bars, clamps, hardware, instructions, and customer support to get the job done right! Have a question? Call us at 800-766-5291. 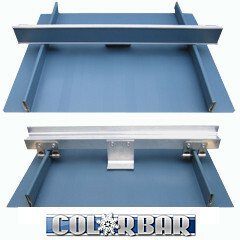 ColorBar is our heavy duty, structural aluminum bar typically used with heavier snow loads or seams wider than 16". The strength of the bar is the backbone of any rail system and this one is used regularly on seams up to 42" wide. It weighs 40% more per foot than the competition's bar thanks to our superior deflection strength! ColorBar is designed to accept optional 2” ColorStrips for a fast, economical color match. We design systems for most roof panels and roof types, we have specialized mounts for membrane and shingle mounting too! Our exclusive Double-Bar Mounts are perfect for projects that require a two bar system in their specifications. This innovative mounting system allows SnoBar/ColorBar products to be safely installed on standing seam roofs without leaks, damage, or voided warranties. 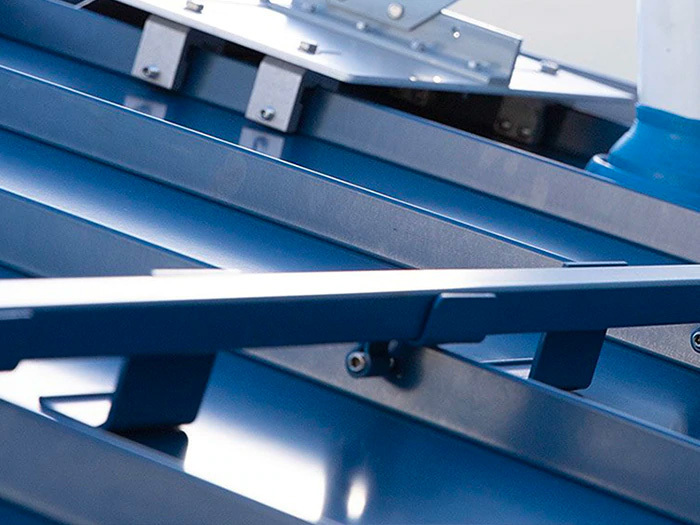 Constructed from extruded aluminum and utilizing the proven power of our patented RoofClamps, these mounts can be used for new or existing roofs. Attachment is achieved with our "Cupped Tip Stainless Steel Screws". These specially designed screws permanently anchor to the seam. They require 90/in.lbs of torque, whereas round tip set screws can require up to 180/in.lbs. Less torque means more efficient holding power and less chance of damaging the seam. Installation is fast and easy, while avoiding costly damage to the roof's finish. The ColorBracket is an attachment point for SnoBar and ColorBar systems. This bracket is used for a screw-down application when mechanical attachment of SnoBar or ColorBar is intended. There are 2 sizes of ColorBrackets made to accommodate most screw down metal roofs. The tall bracket is used on PBR-style panels while the smaller bracket is more commonly used on 2.67 corrugated roofing. IceStoppers prevent sheets of snow and ice from sliding under the bar. They mount to the upslope side of the bar with 2 self-drilling tek screws that are hidden from view once installed. The "foot" prevents them from bending under the bar and they don't slide side to side or allow snow to ramp over the bar like other products. They are always recommended, especially over pedestrians areas. They can be easily added to new SnoBar and ColorBar systems or retrofitted for existing systems. They can also be custom powder coated to match the rest of the SnoBar and ColorBar components. Our exclusive new Shingle Mounts allow SnoBar and ColorBar products to be safely installed on Shingle roof systems without roof leaks, shingle damage, or voided warranties. 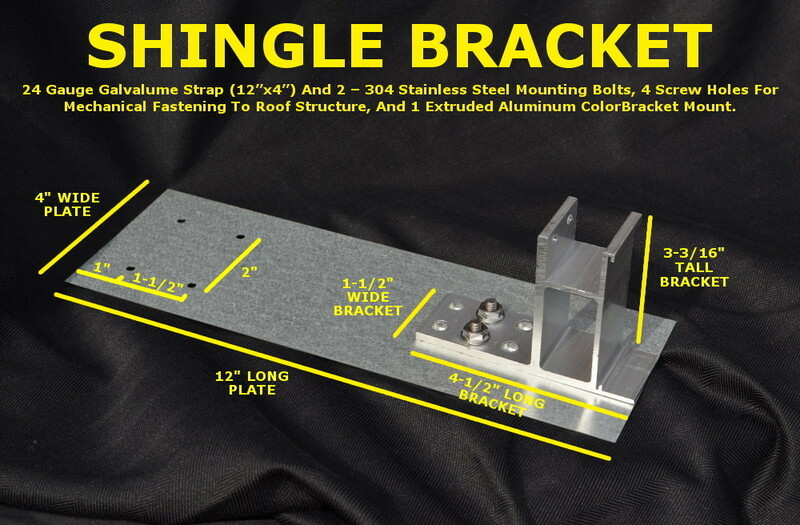 Shingle mounts are fabricated with a 24 gauge Galvalume strap(12”x4”) and 2 – 304 Stainless Steel mounting bolts, 4 screw holes for mechanical fastening to roof structure, and 1 extruded aluminum ColorBracket mount. 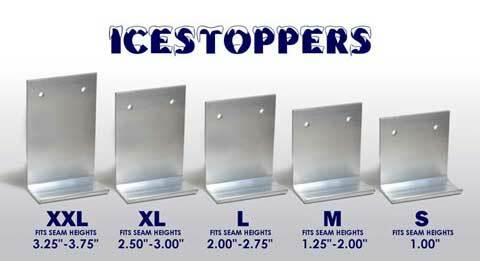 These mounts can be used for new or existing roofs. This is the fastest installing system on the market due to the exclusive top-loading mounts that allow the SnoBar/ColorBar to be set down into the mount instead of having to be fed thru the mount. Fast and easy installation means lower labor costs and less chance of scratching the bar’s finish! The product includes a lifetime warranty on all components for all systems that are installed as per the manufacturer's recommendations. In addition, the manufacturer carries full liability coverage so you can install with confidence! SnoBar/ColorBar has 20 years of field proven results, it installs faster with less chance of damage to the finish, while saving on labor! If you have a shingle roof and need a snow retention system, call us at 800-766-5291. Our exclusive new Membrane Mounts allow SnoBar/ColorBar products to be safely installed on Membrane/TPO type roof systems without roof leaks, membrane damage, or voided warranties. 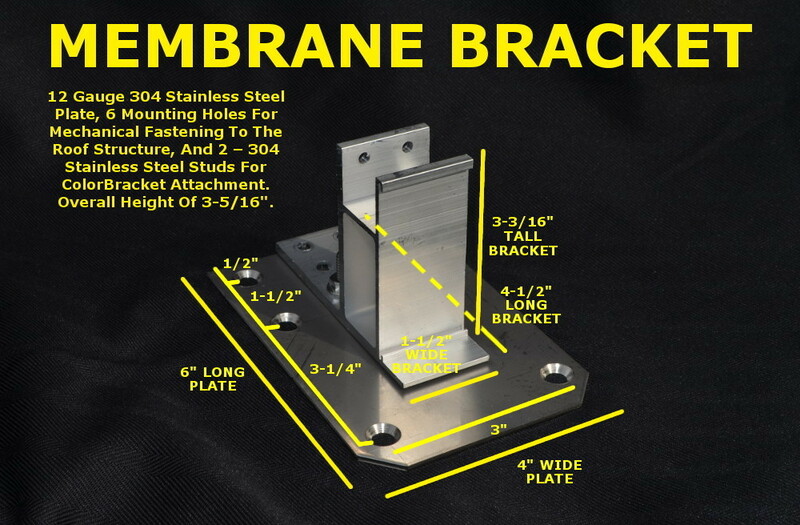 Membrane mounts are fabricated with a 12 gauge 304 Stainless Steel plate, 6 mounting holes for mechanical fastening to the roof structure, and 2 – 304 Stainless Steel studs for ColorBracket attachment. These mounts can be used for new or existing roofs. They are designed to be mechanically fastened over the base membrane layer then flashed over by a 12”x12” square of membrane for a watertight seal. If you have a membrane style roof and need a snow retention system, call us at 800-766-5291 so we can discuss your project.